After six hard months of schooling, Raisa is assigned as a navigator with the all-women Night Bomber Regiment. Their aircraft is the PO-2, a biplane made of wood and fabric. Months later, after a night of heavy losses, Raisa is given a field promotion and the new responsibility of pilot. She has no choice but to carry out her orders and face down a most significant enemy…her own fear. She skimmed just above the tree tops, then pulled the throttle back and eased the nose down. The PO-2 dropped obediently to the dirt and we taxied much faster than normal, passing our mechanic and rolling toward headquarters. I was out of the cockpit and on the wing before she could finish. My legs were strong and I raced to HQ. I spilled out our sighting to the Major, who immediately instructed her aide to contact General Budanov. I paced anxiously waiting for orders. I sprinted out of the office, vaulted onto the wing and into my seat faster than I ever had moved. I grabbed the microphone. “We are to keep them where they are. Mark their location until troops can arrive.” I was completely out of breath. “Very well, Navigator. It seems that we have one last mission before we sleep.” Yevgeniya spun the plane around and taxied to the end of the strip. Four mechanics raced to the aircraft and held the wings again. Dirt and rocks spewed as she revved the engine and signaled for release. My heart was pounding and my hands shook so it was difficult to fasten my harness. The Germans were only a few kilometers away. It was only a few soldiers. But perhaps they were reconnaissance and that would mean more were soon to follow. One fear eclipsed another. The trees were of no concern. I leaned over the cockpit to the left and to the right, scanning the ground for the enemy. Yevgeniya climbed out, then banked hard to the right. There below was the field. The soldiers were still out in the open. It looked like a dozen or more. They did not fire. Perhaps they underestimated our small, harmless-looking biplane, putt-putting over their heads. I pulled out the flare and slid it from the metal container. “Ready to drop”. Yevgeniya lowered the right wings again and I let it go. We both watched over the edge as the tiny parachute drifted down. It erupted into a hot white flame illuminating the area. I felt a little like a lioness stalking a helpless calf as we circled above their heads. “Hold on, Navigator. I have a surprise for these bastards.” Yevgeniya shoved the control stick forward and accelerated toward the ground. My body strained against the harness. My stomach lurched and my hands tingled. Wind screamed through the struts. Bullets whizzed by. I couldn’t talk even if I had wanted to. Stay calm. Stay calm, the voice in my head chanted. The ground climbed upward to meet us. My eyes and mouth were wide open. A bullet screamed by my head. The needle of the altimeter dropped steadily. “Thirty meters…twenty meters…” I yelled out. My head began to spin and tingle. Stay calm. Stay calm. Stay calm. The control stick began to move back. The descent slowed. Unbelievably the engine grew quiet. Yevgeniya had throttled back. “Fi…Fi…Five meters.” I panted into the microphone. My thighs, stomach, arms all tensed waiting for impact. I held my breath and glanced over the side just in time to see the soldiers throw themselves on the ground. We shot over the top of them, and at the sight Yevgeniya let out a hearty long laugh. She was truly enjoying this. I forced out a breath, tried to make my muscles relax, and immediately cursed myself for being afraid. Yevgeniya does not make mistakes, I reminded myself. “Did you see that, Navigator? Was that a sight to behold?” The control stick came full back into my lap and I heard the engine’s RPM increase. “Hang on, let’s do this again. Bastards!” She had become the machine. We climbed again. I strained to relax, to trust our plane, to focus on something other than fear. Geniya was the best in the regiment, and I should be learning from her, not cringing and reminding myself to stay calm. I steadied my voice. “Yes. I am ready this time.” I took the stick and my feet hovered lightly on the rudder pedals. I am ready this time. I am ready. Two more times we climbed and dove on the soldiers. I began to feel a small exhilaration. Yevgeniya’s joy for flying was infectious. Or perhaps it was pleasure from witnessing the so-called invincible Nazi soldiers lying face down in the dirt like frightened puppies. Nonetheless, my spirit felt free, if even for only a few minutes. On the last pass over the heads of the Germans, I saw that they were no longer looking up, rather, at soldiers coming from all directions. Russian troops had arrived. Yevgeniya made a sharp turn and cut the throttle. She dropped down into a slow wings-level glide. I could hear the men cheer as we passed over their heads. She let out her great laugh one more time. I waved. “Yes, heroes.” I had forgotten fear and felt the exhilaration of flying. Working the control stick and the rudder pedals felt very comfortable. She added full throttle and we climbed up and turned toward the sun which now sat on the horizon. 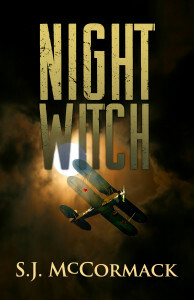 I felt satisfied and exhausted; it was time for this team of Night Witches to retire. We skimmed over the trees and dropped down to the strip. There, at the end of the field, waited the whole squadron. Yevgeniya taxied. The jarring ride felt like nothing. Tamara was waiting and guided us to the hardstand for the day. The crowd burst into a run toward us. “Three cheers for Yevgeniya and Raisa!” Everyone was giddy. Major Vera Malkova stepped through to the front. “Congratulations are in order. General Budanov just radioed his sincere gratitude. He said that they could not have done it without you.” They cheered again. “But the highest compliment of all was that he felt that the squadron had some fine pilots. I believe his exact words were ‘very fine pilots’!” She reached out and shook Yevgeniya’s and my hands.